I open this lesson with a discussion that a writer should spark a reader’s interest from the opening line because the reader could easily abandon that reading for something more interesting. We go through the 5 strategies on page 1. With each, we highlight where exactly we are using each hook strategy within the example. Then, on page 2, students work as a group to write a hook in any 1 strategy of their choice, but I have all groups do the same topic so we can see the variety of hooks that come from 1 topic. 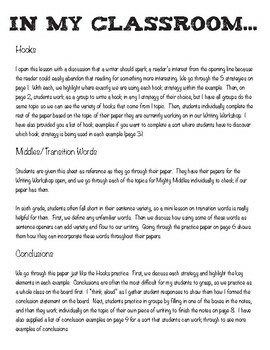 Then, students individually complete the rest of the paper based on the topic of their paper they are currently working on in our Writing Workshop. 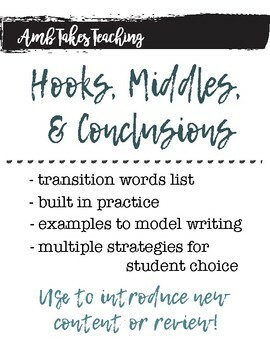 I have also provided you a list of hook examples if you want to complete a sort where students have to discover which hook strategy is being used in each example (page 3). Students are given this sheet as reference as they go through their paper. They have their papers for the Writing Workshop open, and we go through each of the topics for Mighty Middles individually to check if our paper has them. In sixth grade, students often fall short in their sentence variety, so a mini lesson on transition words is really helpful for them. First, we define any unfamiliar words. 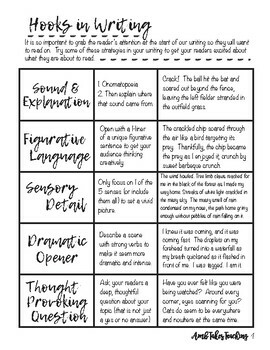 Then we discuss how using some of these words as sentence openers can add variety and flow to our writing. 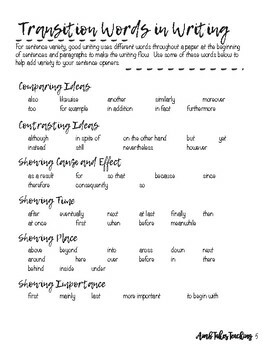 Going through the practice paper on page 6 shows them how they can incorporate these words throughout their papers. We go through this paper just like the Hooks practice. First, we discuss each strategy and highlight the key elements in each example. Conclusions are often the most difficult for my students to grasp, so we practice as a whole class on the board first. I “think aloud” as I gather student responses to show them how I formed the conclusion statement on the board. Next, students practice in groups by filling in one of the boxes in the notes, and then they work individually on the topic of their own piece of writing to finish the notes on page 8. I have also supplied a list of conclusion examples on page 9 for a sort that students can work through to see more examples of conclusions. Purchasing this product grants permission to use by one teacher in his or her own classroom. If you intend to share with others, please purchase an additional license.